In his research, Feng applies what we know about the laws of nature at the smallest length scales to determine what the Universe is made of. “This field is advancing very rapidly, and it's a great time to have a chance to absorb the latest developments and also possibly to wander a bit off the beaten path,” he says. Feng was among 178 scholars, artists, and scientists selected from nearly 3,000 candidates from the United States and Canada to receive the fellowship. Additionally, Feng was one of the two physicists selected. Feng holds degrees in physics and mathematics from Harvard, Cambridge, and Stanford universities. He joined the UC Irvine faculty in 2001, and was appointed Professor and Chancellor's Fellow in 2006. His work has been recognized by several awards, including the NSF CAREER Award, UCI's Distinguished Assistant Professor Award for Research, the Outstanding Young Researcher Award from the International Association of Chinese Physicists and Astronomers, a Sloan Research Fellowship, and a Simons Fellowship in Theoretical Physics. 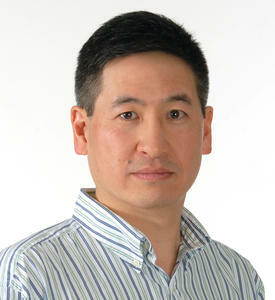 UCI Professor Jonathan Feng was honored with a 2014 Guggenheim Fellowship.